Several weeks back, a local seafood department was running plump, dry-pack sea scallops on sale. I picked up several pounds for the freezer. Today I appreciate my thinking ahead; it seems my cupboards are bare aside from pantry staples and frozen goods. I do have one fresh item, a remaining tomato I plucked before the first frost that is finally ripe, and a baggie of (slightly) worn basil from the final harvest. The ingredient list may appear long, but you may be surprised to have many of these items on hand. Substitutions encouraged! The recipe makes lots of sauce, which we enjoy, but it may accommodate additional pasta and scallops, if desired. Whisk tomato paste and cornstarch into seafood stock and combine. Add saffron and diced tomato to seafood stock mixture. Let sit at room temperature as you assemble meal. Bring a large pot of salted water to a boil. Cook pasta according to package instruction s and in the last minute of cooking time, add peas to boiling water. Drain and reserve. While pasta is cooking, heat oil to high in a large sautÃ© pan. Sear scallops 2-3 minutes on each side, or until golden brown. Do not wiggle pan or fiddle with scallops as they cook or they will lose their crust. Remove scallops from pan, reserve, then deglaze pan, whisking continuously, with wine. Reduce heat and stir in reserved tomato-stock mixture. Let simmer 4-5 minutes or until slightly reduced and cornstarch flavor is gone. Stir in butter, if using, and basil. Season to taste with kosher salt and red pepper flakes. 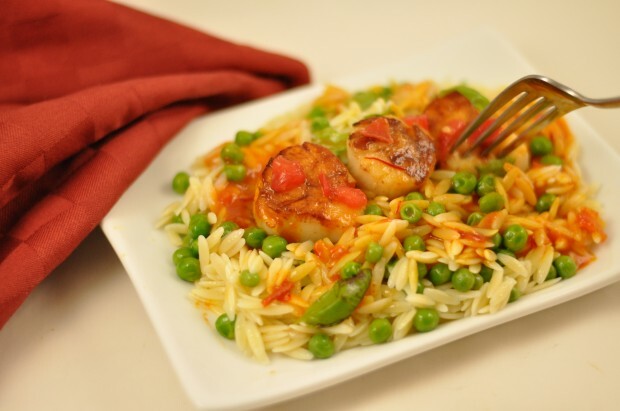 Return scallops to pan and serve with orzo and peas. *Visiting the Saffron Market in Istanbul was a wonderful experience. But those treasures are depleted, and Trader Joe’s and our local Mediterranean Market on Ellsworth have the best saffron prices (for decent saffron) I’ve found. More Recipes Filed Under "Creative leftovers"